Technically a chemical weapon, tear gas is seeing heavy use in Turkish protests. A protestor in Taksim Square in Istanbul throws a tear gas canister back at police on June 11, 2013. On Wednesday, hundreds of Turkish riot police forced thousands of protestors out of Taksim Square in Istanbul, by showering them with tear gas and blasting them with water cannons. The square has been ground zero for protests that started on May 31 with the goal to stop developers from cutting down trees—but the unrest has since spread to broader issues and at least 78 other Turkish cities, according to news reports. Protesters have been calling for an end to the leadership of Prime Minister Tayyip Erdogan, citing what they call increasingly authoritarian measures, including restrictions on alcohol sales, separation of genders in schools, and other issues. The Turkish Human Rights Foundation has reported that four people were killed in protests Tuesday and that nearly 5,000 people have been treated for injuries, including widespread exposure to tear gas. Use of tear gas in warfare is banned by the international Geneva Convention, and its use on civilian populations remains controversial. A number of governments have used it to suppress Arab Spring protests (see photos) in recent years, causing injuries and some deaths. The report documented the case of a person in Bahrain who suffered shortness of breath, wheezing, and difficulty speaking for two weeks after exposure to tear gas. Several women reportedly miscarried as a result of exposure to the agent, and a man with asthma died of acute respiratory failure after inhaling it. To better understand the dangers of tear gas, National Geographic reached out to Sven-Eric Jordt, a professor of pharmacology at Yale University School of Medicine. In the early 2000s, Jordt discovered that tear gas works on the body by activating pain receptors. Jordt had been exposed to tear gas himself in the 1980s, when he was a student in Germany and attended a protest against nuclear waste. Can you give us a brief history of tear gas? Tear gases are not really gases; they are solids or liquids that get turned into aerosols. There are a number of chemicals used that are called tear gas. Gases called CS and OC are used almost exclusively nowadays worldwide. OC is oleum capsicum (chili pepper oil), the active ingredient in pepper spray containing capsaicin, the highly pungent natural product. CS gas contains a chemical named 2-chlorobenzalmalononitrile, a highly electrophilic agent activating pain receptors. Other agents have been used in the past, including some that are illegal now due to toxicity. CN gas was used in Vietnam in the Vietcong tunnels. Tear gases are nerve gases that specifically activate pain-sensing nerves. Spelled out like that, people can better compare them to other nerve agents out there. That’s the major discovery we made, that they are not benign or just irritants. Tear gases were identified [and used] in World War I but without the knowledge of [how they work on] biology. Can you summarize your lab’s work on tear gas? 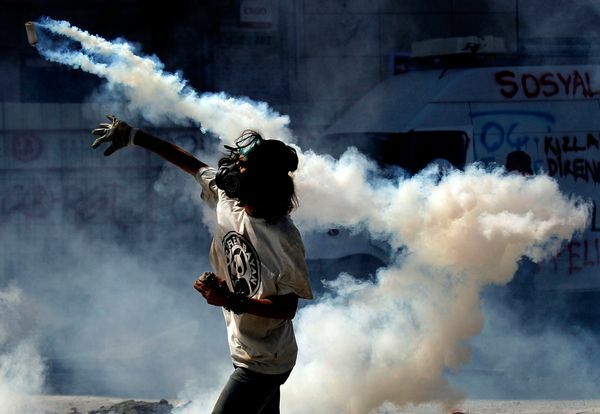 In 2006 and 2009 we published papers identifying a receptor for pain that is activated by tear gas, which causes the body’s response: closing of eyes, a rush of pain, bronchial spasms that make it difficult to breathe, etc. Since then we have received funding from the National Institutes of Health to identify countermeasures to these effects, for acute and long-term exposures. What have you learned about these new tear gas receptor blockers so far? We haven’t published this yet, but what we see is these blockers reduce the pain responses in animals, and also the inflammatory swelling of the skin exposed to tear gas. When tear gas is deposited on the human body, it can cause burn-like injury and swelling, especially [in] parts of the body that are more moist, like eyes and armpits. These results have not made it into any clinical trials yet, but they are interesting for general pain medications, because these receptors are not just involved in tear gas response—they also respond to other painful stimuli and smoke irritations. The receptors are designed to warn a human or animal about exposure to a noxious chemical, so the animal removes itself from the exposure. They increase survival. Could such tear gas receptor blockers eventually be used by protestors? It’s hard to say; in principle, yes. But taking it before an exposure could be very dangerous. If you did not feel pain at lower levels of exposure, and therefore did not leave, it could lead to more serious burn-like injuries at higher levels of exposure. Should tear gas be used on people? I get asked this a lot. Tear gas under the Geneva Convention is characterized as a chemical warfare agent, and so it is precluded for use in warfare, but it is used very frequently against civilians. That’s very illogical. There are enough examples where people suffered severe injury and burns, especially in enclosed environments or city streets with several-story buildings. Residents who live near Tahir Square in Cairo that have gotten a lot of tear gas have had long-term exposure, leading to respiratory problems. Long-term exposure is very problematic. People with asthma or other conditions can have very severe reactions. Tear gases are very serious chemical threats. I think it is very problematic to use them. Their use in Egypt and Turkey has been especially excessive and dangerous. Law enforcement has to weigh the risk of tear gas injury of bystanders against gaining control in a riot situation, under the assumption that rioters break the law. Governments need to put in place immediate decontamination procedures for areas, and especially residences, when tear gas is used. In the U.S. some activists have argued that their civil rights have been violated by use of tear gas against them. What do you think of cases like that? In the U.S. law enforcement uses a lot of pepper spray, which also activates pain receptors and can have serious effects, but is not as toxic or severe as the classic tear gas that is being used in the Middle East. I think it depends on the individual case, but these agents are certainly not benign. There is no way to disconnect the pain that is induced from the physiological inflammatory effects of these agents. This entry was posted in News and tagged Bahrain, Chemical Weapons, CS gas, Geneva Convention, Gezi protests, Physicians for Human Rights, Taksim Square, tear gas on 12 June 2013 .